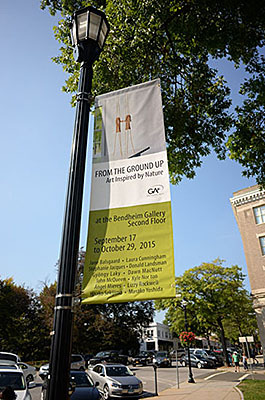 We are pleased to have partnered with the Greenwich Arts Council for From the Ground Up: ART Inspired by Nature, at the Bendheim Gallery in Greenwich through October 29th. The exhibition is beautifully installed by Gallery Director and the gallery space is quiet and contemplative. 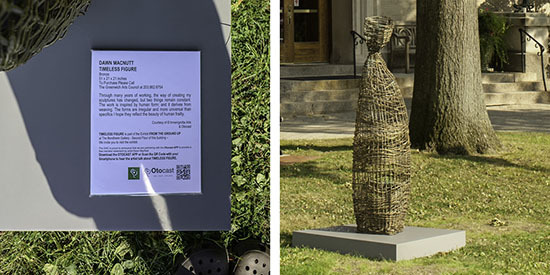 There are three small galleries and a dramatic entry space, where works by Jane Balsgaard, Gyöngy Laky and Stéphanie Jacques join Dawn Mac Nutt’s willow figures, companions to the bronze MacNutt figure that stands in front of the Arts Council Building. 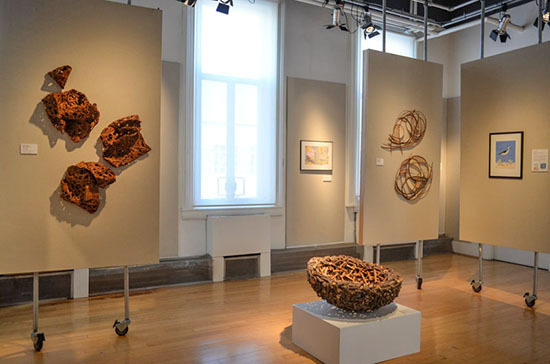 Paintings are interspersed with photographs and sculptures of natural materials, providing viewers a varied view of nature as envisioned by artists. There are 12 in this exhibition, from the US and abroad: Jane Balsgaard, Laura Cunningham, Stéphanie Jacques, Donald Landsman, Gyöngy Laky, Dawn MacNutt, John McQueen, Kyle Norton, Ángel Mieres, Lizzy Rockwell, Hisako Sekijima and Masako Yoshida. The exhibition includes paintings by Ángel Mieres, born in Caracas, Venezuela, whose vibrant, bright works are an abstract exploration of fragile, natural motifs, such as butterflies or flowers. Kyle Norton, who studied photography at Rochester Institute of Photography, takes lush photographs of fruits and vegetables, magnifies their size from a few inches to a dramatic three feet or so — offering nature up close and personal, as it were. 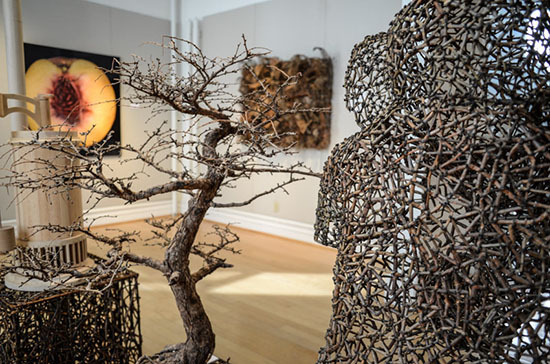 John McQueen‘s three-dimensional works are made of natural materials — twigs, bark, cardboard — he prides himself on not needing to go the arts supply store. 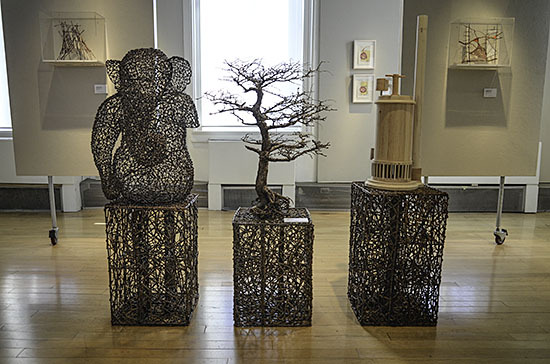 In Same Difference, for example, the juxtaposition of detailed sculptures of the Hindu god, Ganesh, a bonsai and a sump pump is visually engaging. When McQueen explains the simple and smart connection amongst the three —all soak up water, through a trunk, root system or a pump — the work can be appreciated on additional level. 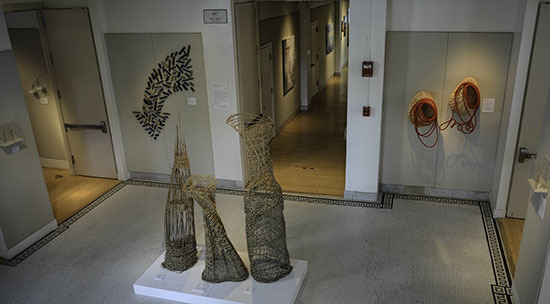 http://arttextstyle.com/wp-content/uploads/2015/09/New-Recording-2.m4a From the Ground Up: ART inspired by Nature, will be at the Bendheim Gallery, Greenwich Arts Council, 299 Greenwich Avenue, Greenwich, CT, 06830 . P 203.862.6750 F 203.862.6753 . info@greenwicharts.org through October 29th. The Arts Council’s Gala, Arts Alive will be on October 17th at the Art Center. To buy a ticket, go to: http://www.greenwichartscouncil.org/Arts-Alive.html. We were pleased to catch up with Grethe Wittrock and fans of her work at the Fuller Craft Museum yesterday, to hear her speak and to celebrate the opening of her first solo exhibition the US. 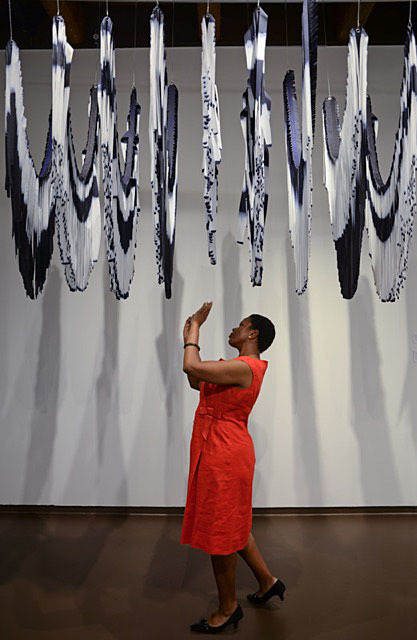 The installation, of sails that Wittrock has re-purposed and re-envisioned, dyed and cut, is dramatic, its shifting shadows giving visitors a sense of being near the sea. 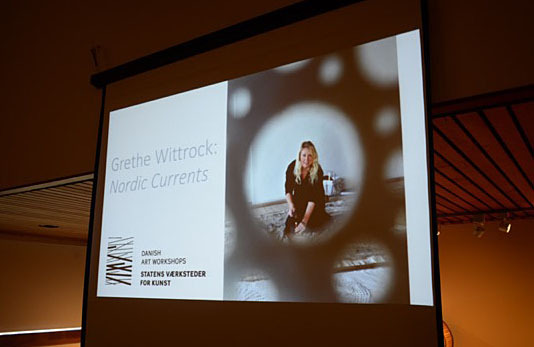 In her lecture, Wittrock spoke about this work and about her initial SAIL project at the Danish Arts Workshops using sails from the training vessel Georg Stage, which is moored at Holmen in Copenhagen in between cruises. Wittrock began by punching holes and tying knots through the sails to create designs and then transitioned to painting and dying them an finally to cutting sails and sailcloth to resemble bird wings. The maritime signal colors of neon orange and yellow are the dominating colors in the project, and patterns representing rope bindings, nautical maps and underwater seascapes are transferred by means of printing and perforation. Wittrock’s dual goal is to shape the material in accordance with her idea while also incorporating the potential and expression of the material itself. 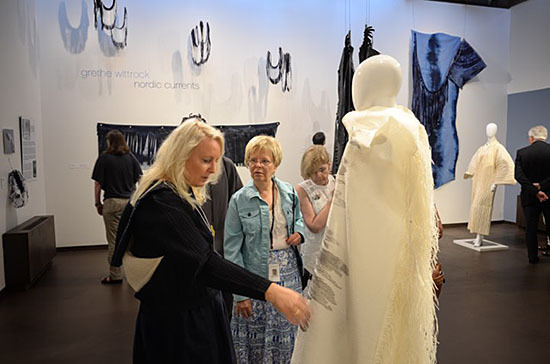 The SAIL project is based on a piece of age-old utilitarian textile that has served in all sorts of wind and weather conditions, and which is a carrier of stories from voyages to destinations near and far.